The recent use of computer vision techniques for monitoring ecosystems has opened new perspectives for marine ecology research. These techniques can extract information about fish populations from in-situ cameras, without requiring ecologists to watch the videos. However, they inherently introduce uncertainty since automatic information extraction is imperfect. To be accepted for scientific use, video analysis tools must support the analysis of the extracted information and of their uncertainty. Another challenge concerns the diversity of scientific interests. Ecologists have diverse research goals and information needs, for instance specific species, time periods, or locations. 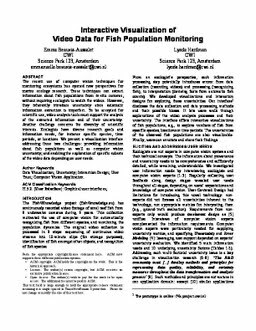 We present a visualization interface addressing these two challenges: providing information about fish populations as well as computer vision uncertainty; and enabling the exploration of specific subsets of the video data depending on user needs. Beauxis-Aussalet, E.M.A.L, & Hardman, L. (2014). Interactive Visualization of Video Data for Fish Population Monitoring . In D van Leeuwen, P.J Stappers, M H. Lamers, & M.J.M.R Thissen (Eds.), . CHI Sparks.